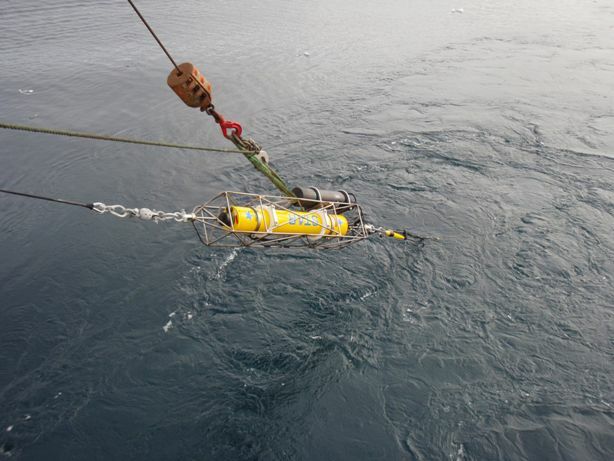 The main objective of ACOBAR is to develop a system for environmental monitoring of the interior of the Arctic Ocean by assimilation of data obtained with acoustical methods including tomography, data transmission from underwater platforms, communication and navigation of floats and gliders under the ice-cover. The envisioned basin-wide mooring grid in the Arctic Ocean (mid panel), the updated outline of the ACOBAR AITP Arctic observing system (left panel) and the existing moored observatory (tomography and oceanographic) in Fram Strait (right panels). 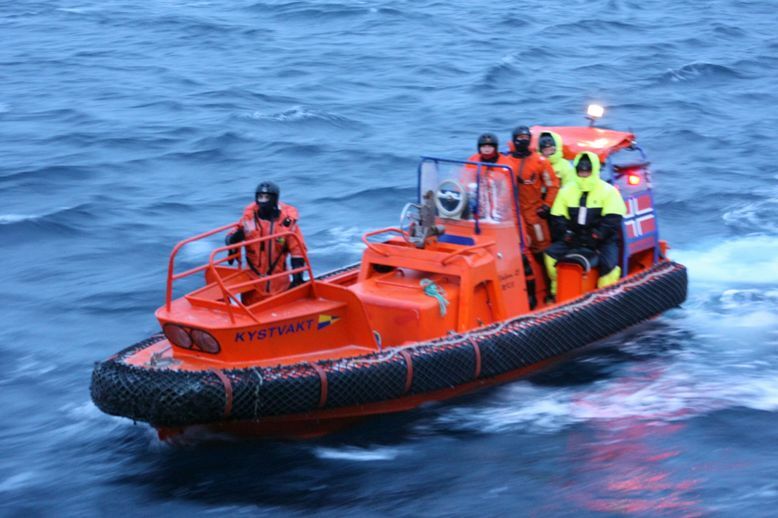 In addition, profiling gliders and floats capable of under-ice acoustic navigation will be employed. 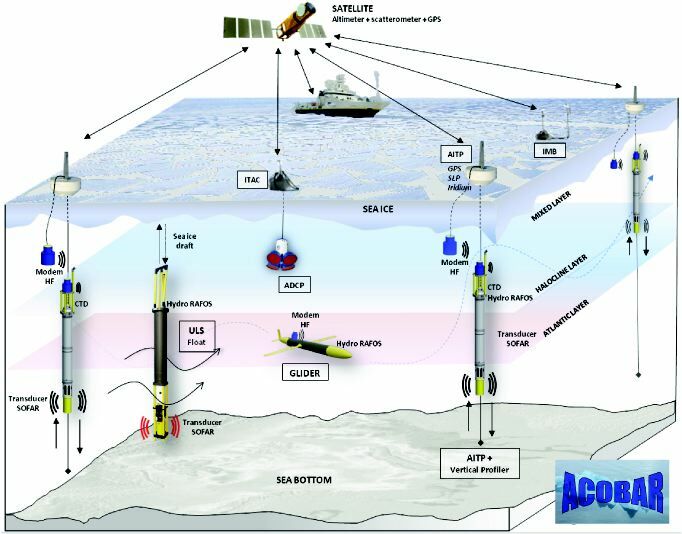 Arctic Ocean Observing system. AITP stands for Acoustic Ice Tethered Platform. In the Arctic clusters of AITPs are planned for the interior Arctic to obtain high accuracy regional navigation of gliders. The ACOBAR Array is based on 4 units each composed of a surface buoy unit containing a satellite iridium transmitter and a GPS, an acoustic modem (Aquatec), a processor and basic meteorological sensors for air pressure and temperature at surface + high capacity lithium batteries. In addition a Sterne sea glider is operating within the cluster of 4 ACOBAR AITP in a quasi autonomous mode without connection with the surface. The Sterne glider is equipped with a RAFOS receiver for fixing and ranging over long distances from the AITP ACOBAR platforms and also with an acoustic modem for transferring CTD data from the glider to the AITP (via the AITP acoustic modem). The ULS floats are part of the DAMOCLES project (not operated during ACOBAR). As a back up and for safety reason the Sterne glider is equipped with an ARGOS 3 transmitter for localisation once at ocean surface in ice free waters. 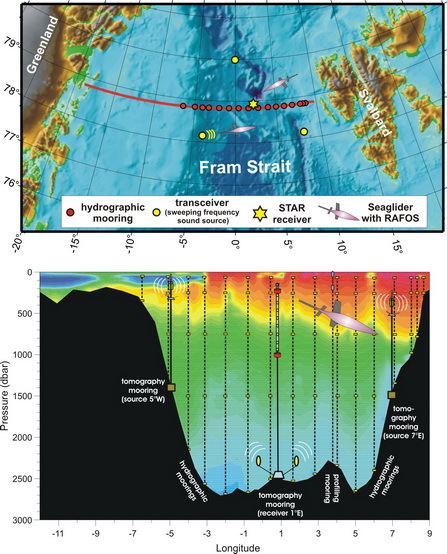 The Fram Strait acoustic network for tomography and navigation of gliders. The right upper panel shows the acoustic system as deployed with RV Håkon Mosby and KV Svalbard in august/September 2010. The triangle in the SAR image is formed by the transceiver moorings in A, B, C and in the middle the receiver mooring D is positioned. 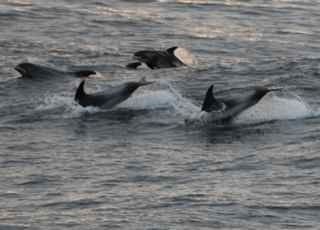 The acoustic moorings are separated by 100 km upto – 300 km. The satellite image show how the tomographic moorings (yellow crosses in the triangle) and the RAFOS sources (yellow crosses outside the triangle) are positioned in the MIZ. This is what makes the system unique and important both for navigation of gliders in under the sea ice and out again, and for the acoustic tomography. The acoustic observation system is co-located with the fixed array of oceanographic moorings array across the strait at 78° 50’ N (white encircled dots). The right lower panel shows positions of moorings overlaid on the temperature distribution in Fram Strait where red is warm water and blue is cold water. 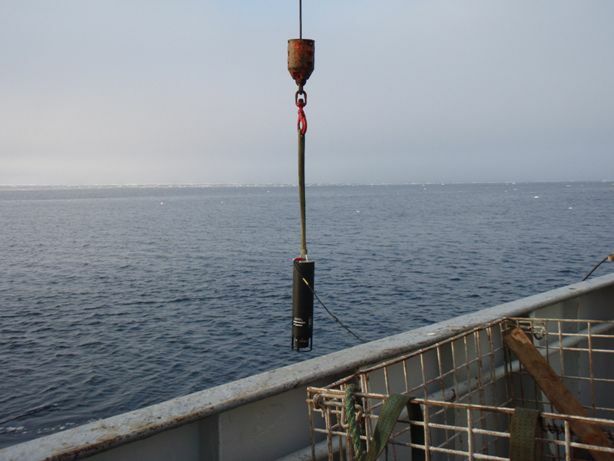 Each mooring records low frequency ambient noise, and represents a unique and forefront passive acoustic monitoring system of marine mammals. While tomography is superior to the glider technology in temporal resolution, the glider provide ocean data at a much higher spatial resolution. A region with strong mesoscale activity as in the Fram Strait requires both high temporal and spatial resolution of the observations. Therefore, we have proposed to establish an integrated data and model system combining acoustic tomography, gliders, point measurements and ice-ocean modelling with data assimilation techniques to improve the accuracy of the heat, mass and freshwater transport estimates through the Fram Strait. Acoustic remote sensing techniques can provide unique, synoptic and integrated measures of internal ocean temperature at an accuracy of 0.01°C along the acoustic tracks.